You are here: Home / Blezard, Rob / No power for worship? Hurricane Irene knocked out power in our little Pennsylvania hamlet beginning midnight Saturday, so there was no electricity for Sunday worship. That meant no lights in the sanctuary (and, more importantly, the windowless restrooms, no elevator for those who can’t climb steps to our second-floor worship space, no air blower to drive the big pipe organ, no P.A. or system for the hard-of-hearing, no air conditioning and no coffee. I stood in the eerily silent sanctuary, the light from the pewter clouds filtering gloomily through the stained glass, and could think of only one thing to do: Cancel worship. But I began thinking that with a little planning it would be easy to hold worship without electricity. They did it in the very same sanctuary when it was first built in 1881. The place was illuminated by candles and gas light. No, the only energy really needed for worship is from the Holy Spirit. As in the Day of Pentecost, the Holy Spirit can provide all the air conditioning, all the sound effects and all the light you need. 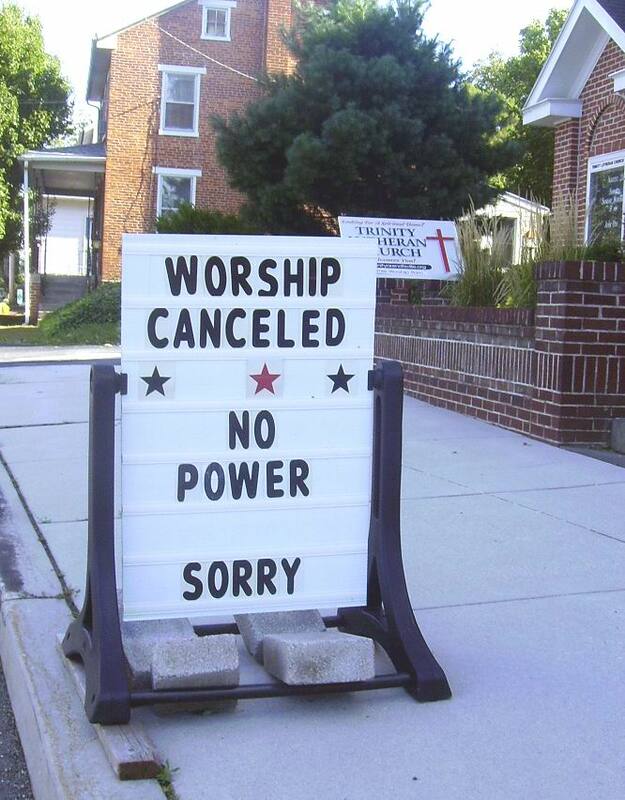 Without the power of the Holy Spirit, a church might as well cancel worship. Yet how many churches continue week after week, relying only on the power that comes from the electric company and the frail human energy of pastor and layfolk? Maybe we need an occasional electricity outage to remind us of the REAL source of our energy, power and sustenance. Holy Spirit, be our guide, be our light, be our power. Electrify our souls with your love and let us glow like a tungsten filament for all the world to see. Amplify our puny human voices so that your word is proclaimed and heard. Blow into our congregations afresh every Sunday.